The weather couldn't have been better on a recent Friday afternoon in Detroit. Not that you would know from inside the Green Garage, a small business incubator and coworking space located in Midtown. 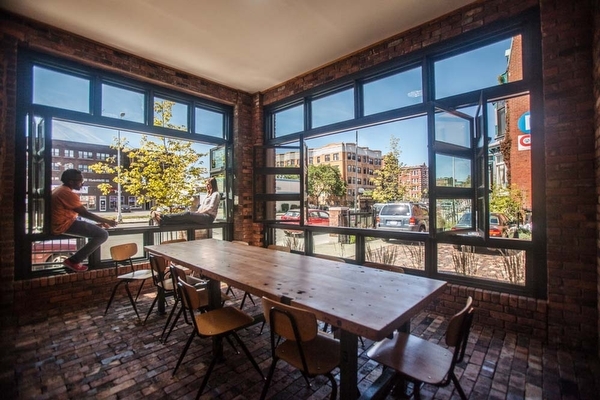 That's because the Green Garage optimizes climate and light through its use of ventilation, high-performance Cardinal glass windows, and super-insulated envelope. The weather, so to speak, is always great inside the Green Garage. The various shades of wood and brick, and spacious feeling generated by open cubicles and high ceilings also contribute to the comfortable ambiance. A weekly Friday community lunch, which is open to the public and offers a networking meal followed by an informative presentation, had just wrapped up. That week's was given by two Belle Isle officials talking to a packed group of about 50 on the latest developments taking place on the island. The event, the day, the people, the atmosphere, all encapsulate what works so well at the Green Garage, now in its fifth year of operation. An ethos of sustainability imprints itself on every feature—the building's design, the operation of resident businesses, its management structure, waste disposal. "We like to call this a community-based, deep exploration of sustainability in an urban environment," says Tom Brennan, co-owner of the Green Garage with his wife Peggy Brennan. 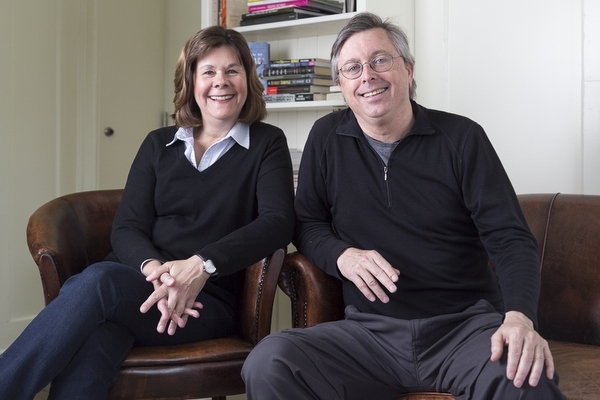 Peggy and Tom Brennan, co-owners of the Green GarageThat deep exploration began in 2007 when the Brennans purchased a former Model T showroom on 2nd Avenue that had been vacant for over a decade. Over the next three years, the Brennans and their team did a historic and green redevelopment along with a careful consideration of the kinds of residents they'd like to fill the space, and the systems they'd implement for their harmonious integration. All that hard work and patience paid off. A remarkable percentage of Green Garage residents are still operating or have outgrown the incubator. And the fact that very little has changed in those five years demonstrates they've done a lot right—that their model of sustainability is itself sustainable. Though residents of the Green Garage span many sectors, they all share two characteristics: they're interested in being part of a community of businesses and in reducing the environmental impact of their work by locating there. The Green Garage is a triple bottom line business, which means incorporating the environmental and social costs of an operation alongside the financial. "All our decisions are based in care for earth, care for the community around us, and economic viability," says Green Garage Matthew Piper of the Green Garageemployee Matthew Piper. "We have a saying," says Tom Brennan. "'All businesses are triple bottom line businesses. Some know it, some don't.' Every businesses impacts their community. Every business impacts the environment." Looking at each bottom line in turn reveals something insightful about the Green Garage's operations. The commitment to responsible environmental practices begins with the building's design. Tom estimates that the Green Garage uses about 15 percent of the total energy of a normal office building thanks to pex tubing that circulates hot water, roof-top solar panels, recycling, and the features already mentioned (see Model D's interview with Tom from 2014 for a more comprehensive look at his views on green building design). One of the few notable changes at the Green Garage has been an improved composting system—over 10,000 worms housed in the basement munch on the building's organic waste. Emphasis on low environmental impact has clearly influenced the residents as well. 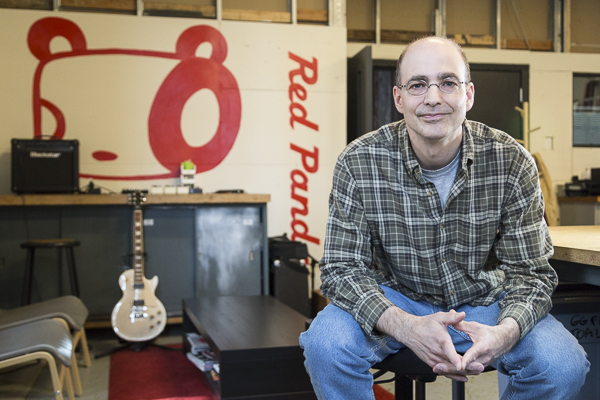 Red Panda, which designs and manufactures guitar effects pedals, moved into one of the Green Garage's three larger workshops in 2013. They're not a classic example of a "green" business, but the Green Garage's philosophy has made an impression on them. Curt Malouin, founder of Red Panda"We're electronics manufacturers," says Curt Malouin, owner of Red Panda, "but we still have minimal waste." They accomplish this through conscientious packaging, powder-coated enclosures for the electronics, and usage of an ultraviolet printer that produces no volatile organic compounds—a noxious offgassing that can pose serious health and environmental risks. "We made an upfront investment to have environmentally-friendly graphics on our pedals," says Malouin. "But it's also more efficient than screen printing, and probably good for our business in the long-term." The second bottom line, community, is as important as anything at the Green Garage. Many residents are dedicated to community improvement; like De-tread, which develops unique solutions for the problem of illegally-dumped tires, or Patronicity, a crowdfunding platform for community-minded projects and businesses. Community also extends to the people who work at the Green Garage. Before becoming a resident, business owners and building management meet several times to make sure it's a good fit for both parties. That's because residents don't simply occupy a desk, cubicle, or workshop—they're expected to contribute to the smooth functioning of the building's systems. That includes organic interactions encouraged by low-walled cubicles and the wall-free kitchen. They're also encouraged to participate in regular events, like the 2-degree meetings—so called because at the Green Garage, there's never more than two degrees of separation—where a resident presents a business-related problem that other attendees help troubleshoot. "Everything here is community-based," says Tom Brennan, "and almost everything—the air, the tables, the kitchen, the library, the food—is shared. A few years ago, Pamela Hilliard Owens was looking for an office for her writing and editing consulting businesses, Writing It Right For You. She'd toured numerous coworking offices around Detroit, but the Green Garage was by far the best fit. 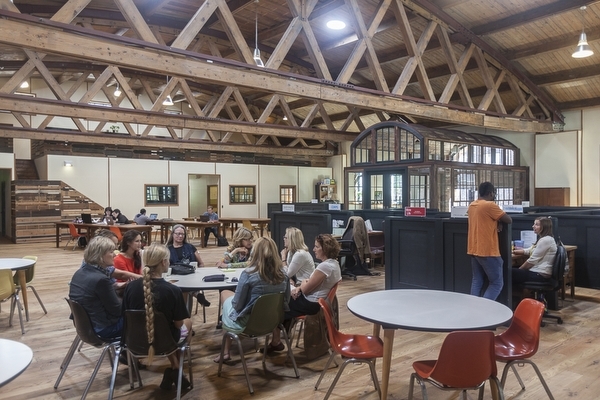 "There are coworking spaces," Owens says, "and then there are coworking communities. Some places you plop your computer down and work. And that's fine. But I was looking for a community." Much like the diversity of businesses at the Green Garage, there's also a diversity of ages, ethnicities, religions, and sexual preferences. And just as building's spatial configuration encourages openness, so too does its emphasis on community. "It's a very open and affirming place," says Owens. "There's a mosque nearby, and our Muslim residents usually go there to pray. But when it's cold or snowy they go upstairs and everyone's fine with that. "We all love each other," she adds. "It's a little microcosm of the way the world should be." Piper says that in five years he's never had to resolve a dispute based on identity. "Everyone gets along fantastically. It's almost like magic." The Brennans also stress the importance of mental health in the workplace. Clean air, natural light, and supportive colleagues all contribute to resident well-being. So does their belief in the integration of passion into one's work. "People have natural talents, but you have to do what you're passionate about," says Peggy Brennan. Well before opening, Green Garage management identified 73 responsibilities and tasks required to run the building. The eight founding team members wrote down which ones matched their interests. In the end only three tasks remained, like window washing, which they hired people to do. "I'm not in favor of creating positions for people who aren't interested in doing them," says Tom Brennan. "Otherwise you get turnover and burn people out. That's another part of sustainability. There's only one hard rule here: you can only do what you want to do." True to his words, none of the management team have titles. Piper, for example, wears a number of hats. He acts as resident arbitrator, interfaces with the public, leads tours and wellbeing activities, and more. A running joke is coming up with new titles for Piper, his personal favorite being "zookeeper"—though "facilitator of all things wonderful" isn't bad either. "Your work here is not defined by position or title, but by roles," says Piper. None of this would mean much if the residents weren't thriving financially. But they are. The Detroit Food Academy (DFA) is an educational nonprofit that teaches Detroit youth about nutrition and food systems through a curriculum that culminates in starting a food business. Before becoming a resident in 2013, DFA worked with one school and 30 students. Now they're in 10 schools educating around 200 students, three of whom run their own business. Their staff has grown to 17. Student-produced goods are in 40 grocery stores regionally. "The Green Garage is integral to the way we run Detroit Food Academy," says executive director Jen Rusciano. "In terms of its structures and logistics, but also in the ideals of community we hold up to our students." 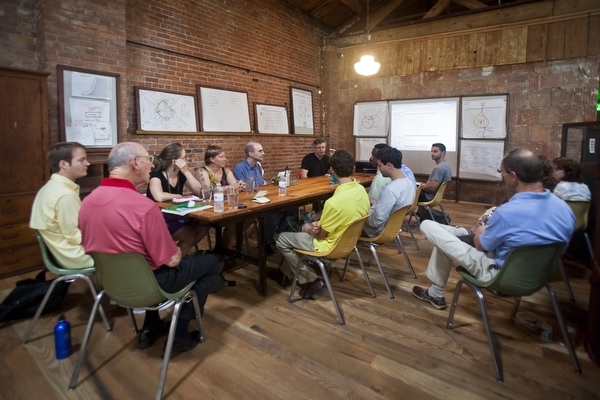 Rusciano cited the Green Garage community support systems, like the 2-degree meetings, as invaluable in connecting her to resources and solutions. "You can make powerful connections here," says Rusciano. "In terms of skills—like legal, marketing, design—to thinking through intangible, broader topics in discussion groups. Putting out ideas to a bigger audience and asking, 'What do you think?' It's helped us solve problems early, and avoid learning things the hard way." 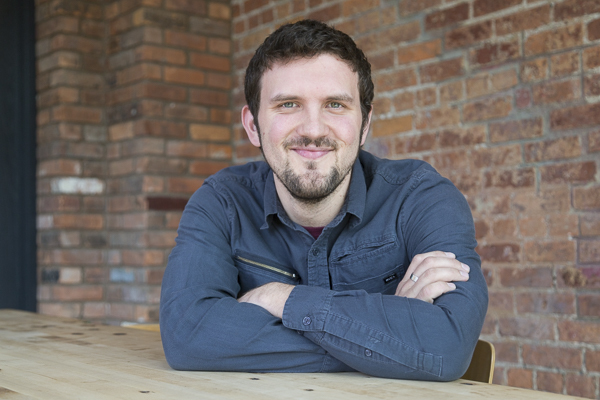 Tom spent most of his professional career at the consulting firm Accenture, and started his own triple bottom line consultancy business, Green Seeds, that operates out of the Garage. One of the tenets he preaches to residents, and practices himself, is patience. "A fundamental principles is slow, intentional growth," says Piper. "Building a solid foundation over time instead of overextending early on." This approach has paid dividends for its residents. Of the 92 that have been at the Green Garage, only five have gone out of business. Considering that the Bureau of Labor Statistics estimates half of all businesses go bankrupt within five years, the resident success rate at the Green Garage is remarkable. The Green Garage has built something unique and successful. But they're not covetous of their secrets—a look at their wiki shows how much they value transparency. There's a painstaking archive of the building's construction and a thorough account of its green design features. Over three years ago, they started documenting, and sharing, measurements of their energy usage. They've also collected a publicly-accessible urban sustainability library, a combination of physical books and online resources, to spread their knowledge on this subject. The Brennans and their team share so much because they feel it's important for everyone to participate in this project. "This journey of sustainability is 300 years long and we're only 20 to 30 years in," says Tom. "This question isn't going away—we're just at the beginning of its impact." "The city and world will keep evolving," adds Peggy, "but our role will remain the same."